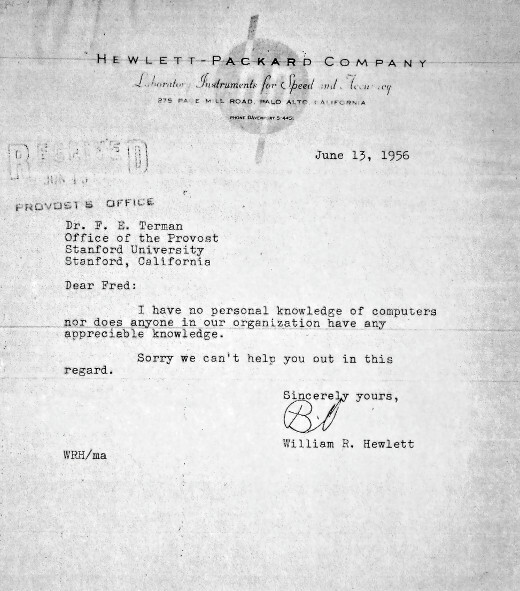 June, 1956: Co-founder of Hewlett-Packard, Bill Hewlett, writes to then-Provost at Stanford and the man widely considered to be one of the "Fathers of Silicon Valley," Fred Terman, "I have no personal knowledge of computers nor does anyone in our organization have any appreciable knowledge." Terman was a member of the US Army Signal Corps' advisory board at the time, and when asked by the army how best to acquire a computer for research purposes, he naturally turned to Hewlett — one of his former students — for assistance. Unfortunately, HP were then immersed in the world of electronic test equipment and, as such, had very little knowledge of a product from which they would eventually make huge profits; hence this reply. 10 years later, they introduced one of the world's first 16-bit minicomputers: the HP-2116A. Transcript follows. Image courtesy of Steve Blank. Many thanks to Mac Harwood for suggesting it. Sorry we can't help you out in this regard.